The Washington and Oregon Cascades have received between 1 and 3 feet of snow over the past several days and we are now gearing up for some 70 and 80 degree temperatures in the valley. We can expect warm temperatures and epic blue skies in the Cascade range. Though it would seem like it would be the best time to visit, you would be warned to expect some pretty dangerous conditions since the snow will be very soft and small or large avalanche dangers will be in effect. I would even recommend staying well within the ski boundaries or if you plan to be snow shoeing. I would advise you to stay well away from any of the cliffs surrounding the back country. This time of year is by far one of the best times to head up to the mountains but I always find myself trying to figure if the dangers are worth the risk. I’ve taken a lot of chances but I can’t really see my self trying to out run an avalanche with a pair of snow shoes and lugging 25 pounds of equipment. This particular shot was taken on the south side of Mt. 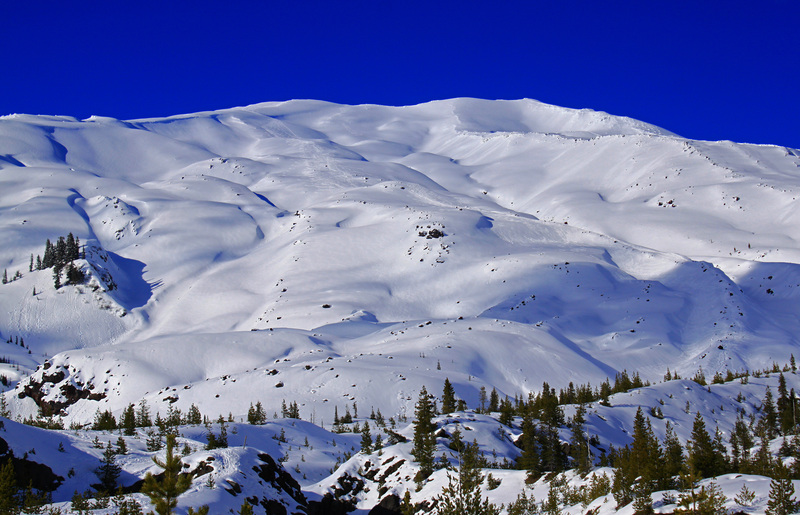 St. Helens and the summit is dotted with snow shoe tracks leading up towards the summit. It’s actually not too difficult to snow shoe but I would recommend that you get there as early as possible, bring lots of snacks, lose the camera weight and have your dinner waiting for you at your car. The drive time from Portland, Oregon is over 2 hours and you will be pretty tired once you get home. I have only brought my tripod with one time when snow shoeing at high elevations and I will never do it again. I like being able to quickly draw my camera and begin panning the area for some great shots. I usually only bring one or two lenses and carry my camera on my front chest for quick draws. Since the snow glare is pretty brutal, I would recommend that you bring a CIR-PL and plan on constantly checking each shot that you take since you will be adjusting your shots almost every time you take a photo. I always utilize my histogram and adjust the white balance whenever needed. I also usually only use my Sigma 17-70mm lens whenever I’m climbing a snow capped mountain since I am more drawn to the panoramic views rather than close ups. This is especially true since I’m already on the mountain and I want to capture the huge landscape that’s either above or below me. I also make sure to layer my clothes and pack survival gear in case I find myself in trouble. I don’t own a avalanche beacon but I rarely take too many chances. However, I will be getting one soon once I’m ready to make the investment. I also snow shoe with my dog so I’m always looking out for his best interest and that pretty much keeps me from going somewhere where he can’t follow me.